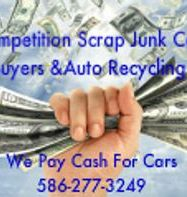 Competition Scrap Junk Car Buyers & Auto Recycling for Cash we pay Top Dollar Cash for Cars. 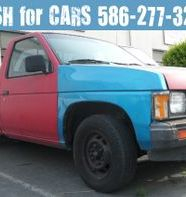 We buy Junk cars,trucks,vans and non-running vehicles 24 hours a day and 7 days a week. 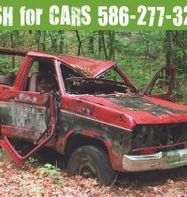 We always pay in Cash for Junk cars. 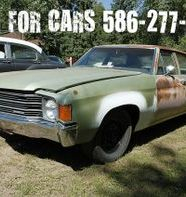 If you need to get money today for a junk car and do not want to haggle or be given the run around we got you covered. 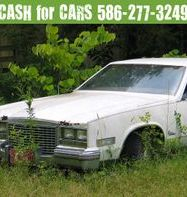 We have been offering cash for cars for over 28 years. We are a family operated cash for cars business. Competition Scrap Junk car Buyers is number one in the business of buying junk cars because we deliver same day junk car removal and have a reputation of paying top dollar based on current scrap car rates. 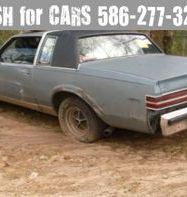 Don't mess around call us today for a cash for cars quote 586-277-3249.